I’ve been writing about sustainable fashion for some time, but I haven’t yet defined my terms or explained why I’m so drawn to it. This post is the first in a series meant to remedy that, borne from hours of research. Sustainable fashion describes clothing that is made by workers paid a fair wage (or preferably, by one or more artist/ designer) that has a small carbon footprint, and is locally sourced, when possible. Choosing to buy sustainable fashion has an environmental, human, and economic toll that, when done over a long period of time by many people, can have a substantial positive impact in the world. Part of the reason I started the HBG Flea, a curated market for local vintage and handmade vendors, with my friend is that STYLE AND ART ARE INCOMPATIBLE WITH SALES AND PROFIT-DRIVEN DECISION MAKING. The business of big fashion is largely driven by an exploitation of human insecurities, and rather than being an inspiring force, I find it is often exclusive, unattainable, and divisive, and dependent upon pernicious practices that kill both the planet and its workers. Despite this, I still love the artistry that goes into creating personal fantasies through style and clothing. It’s possible to care about the problems with the industry while still enjoying , by purchasing sustainably manufactured clothing, I can still explore my own sartorial individuality without participating in the ugly business of fast fashion. This first post will outline the basics of the supply chain of the fashion industry and the environmental and human toll of fast fashion. A supply chain is basically the interconnected steps that go into the production of an item. Sourcing raw materials, constructing the product, then disseminating that product to the stores in which it is sold, make up the basic path of any garment. The production of garments is faster and cheaper than ever before, thanks primarily to a globalized economy. In the 1960’s, 95% of clothes worn by Americans were made domestically; now only 3% of our clothing is made here, according to the documentary The True Cost. The production of goods has been outsourced to the developing world. As fashion brands are primarily concerned with profit, they choose the cheapest labor, putting factories in the position to compete among themselves to make the cheapest products, regardless of how they reduce prices. Cutting corners and maintaining low wages are necessary. These factories are largely under contract, and are given the false choice between retaining their all-important contracts and addressing safety and wage concerns. This system not only keeps wages low, it gives these companies deniability — benefiting from, but not explicitly demanding, this humanitarian disaster. This is an example of a race to the bottom economy, which the financial times defines as “the situation in which companies and countries try to compete with each other by cutting wages and living standards for workers, and the production of goods is moved to the place where the wages are lowest and the workers have the fewest rights.” This perceptual cycle ends with one of three scenarios: either the retail prices must go up, the manufacturers shut down, or the factories will cut corners. As expected, the latter is chosen. The governments in countries like Bangladesh and Cambodia are so desperate for the money from fashion companies, that they won’t do anything for the workers, so regulations either go unenforced or are nonexistent. benefit the workers because a bad job is better than no job. Right now, 1 in 6 people worldwide are employed by the garment industry. This specious claim depends upon the notion that workers receive skills and money to invest in their futures, either through education or better jobs, which is nearly impossible thanks to this cyclical race to the bottom. The workers have tried to unionize, but are threatened and beaten for the attempt. In Cambodia, workers organized protests to fight against the low wages, and they were met by police firing live rounds. These are not the actions of workers who are thankful for their jobs, but those who would rather risk death than maintain the status quo. The driving force behind this production is the manufactured demand for clothing. New styles are constantly being released and updated, so much so that there seems to be a new trend each week. It’s plausible that a middle class person in the Western world could buy a new outfit at a fast fashion retailer each week, or even daily; at only $5, a dress from one of these stores becomes disposable. This manic desire for ever-fluctuating closets depends on sniper-precise branding, which I will discuss more in part two. Fast Fashion isn’t the only polluting industry, but it is the second largest producer, second only to oil, according to Eileen Fisher, a fashion industry CEO. To put that in perspective, drilling for oil, with all of its leaks and pipelines, is the only thing dirtier than the garment industry. In her article for Vogue , Maya Singer uses the example of jeans to show the monumental effects fashion has on the environment. In this one particular case, the cotton is grown and picked around the world and shipped to factories where they are woven and dyed. They are treated with PFCs, chemicals that make them breathable and stain-resistant, and then washed with detergents that contain alkylphenol ethoxylates among other chemicals. Then the finished product is packaged in plastic and shipped back out to countries around the world. Lucy Seigel cites in her book “To Die For” that approximately one and a half billion jeans are made just in Bangladesh each year. That’s just jeans, just from one country. If you can imagine how much dye, chemicals, and transportation is required to outfit the world at the rate we’re consuming clothing, you begin to see that the problem is in part due to the scale of production. The chemicals like those used to treat jeans are often flushed into local water sources, because of deregulation. Denim manufacturers are known to dump cadmium, mercury, and lead into the water sources around their factories. In India, the Noyyal river is now toxic thanks to the boom of clothing manufacturing in the nearby town of Tirupur. The water is so saturated with chemicals that local farmers have petitioned the Madras High Court to not release the water in their fields, and a local university found that about 30% of villagers near the river suffered symptoms of waterborne diseases. In 2007, it was reported that Tirupur’s factories were dumping 23 million gallons of untreated water into the Noyyal River. Near Kempur, the leather capital of India, the Kampur River, a holy river, has been ruined thanks to millions of gallons of water rich with heavy metals used to treat the leather. This also hurts local farmers, but I’d like to hold that until the human toll section. garments that is problematic. Cotton makes up approximately 40% of our clothing, but the plant is one of the most water-intensive to grow. As Newsweek writes, “According to Yixiu Wu, who helms Greenpeace’s “Detox My Fashion” campaign, the average pair of jeans requires 1,850 gallons of water to process; T-shirts require 715 gallons.” Cotton also soaks up other resources, taking 10 percent of all agricultural chemicals and 25 percent of all incecticides, despite only taking up 2.4 percent of the world’s cropland. In some cases, this water is taken from other sources. Two rivers in Central Asia were diverted away from the Aral sea for use for cotton irrigation, causing it to slowly dry up, become over-salinated, and laden with nitrogen from fertilizers used in cotton’s production. The fisheries and villages that depended on this water now have none. Sometimes, it’s the fabric itself that causes problems. Cashmere, for instance, is an example of the tragedy of the commons, an economic theory that predicts that a group of individuals acting on their own self-interest will ultimately lead to ruin by using up shared resources, which harms everyone. Cashmere comes from a particular type of goat, one that has very pointed hooves, necessary for their mountainous habitat, but disastrous in other regions. They also consume 10% of their body weight of roughage, eating close to the root, preventing future regrowth. The overabundance of cashmere goats in the Gobi region have stripped the ecosystem of its vegetation, turning lush fields into deserts. Yes, these goats are literally turning certain grassy regions into deserts. 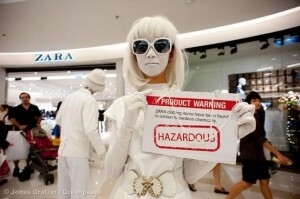 Finally, the fashion industry creates waste and greenhouse gases while contributing to deforestation. It may be the worst trade, ever, though many industries contribute to this same problem. Part of the problem with fashion is how much shipping is involved. Fabric shipped to the factories, then clothing eventually makes it to retail stores, and the sheer volume and frequency of these trips makes for a substantial carbon footprint. Because places like H&M go from the runway to the sales rack in as little as two weeks, this journey from cotton to teeshirt may happen bimonthly. Furthermore, many of these clothes are packaged in plastic which either finds its way into a landfill or on an exotic vacation to the Pacific garbage island. Fabrics made from petrochemicals like polyester and nylon are not biodegradable, so they are just as bad as the plastic bags. Every pair of tights that were thrown out thanks to a run probably still exist in some form on the earth. While creating all of this waste, rainforests are being cut down to make way for more more growing land. Viscose, for instance, is made from wood pulp, and its production directly contributes to rainforest loss. The reason this is so important is that rainforests are the lungs of the world, acting as super factories turning Carbon Dioxide into Oxygen. Ready to be more sad? Because, now I’d like to briefly outline the human cost of fast fashion. In 2013, The Rana Plaza factory in Bangladesh collapsed, killing 1,129 people, the largest industrial disaster in fashion history. Bangladesh has come to represent the very bottom of the value chain, where clothing manufacturers can find the absolute cheapest labor in the world, according to The True Cost, and was thanks to its untenable working conditions. The building had been visibly deteriorating, yet the factory owner, a local leader of the Awami League party, ignored the call to evacuate the building. Thousands were trapped in the rubble, either dying instantly, or being slowly crushed and suffocated in the debris. Stories like this are becoming commonplace, as three of the four most deadly tragedies in the fashion industry happened in 2013. If you think anyone learned a lesson from this, they haven’t. 2014 was the company’s most profitable of all time. Working conditions like this have become commonplace, thanks to the race to the bottom economic problems I’ve outlined in the previous section. After the Rana Plaza incident, the Asia director of Human Rights Watch said that “The government, local factory owners, and the international garment industry pay workers among the world’s lowest wages, but didn’t have the decency to ensure safe conditions for the people who put clothes on the backs of people all over the world.” Wages in Bangladesh are as low as $37 a month, with 15-hour work days, according to Time Magazine. wear come from cotton. The fashion industry has contributed to what scholars are calling the intensification of the agriculture industry, the treatment of the land as a factory, and the push towards increased production despite its effects on the soil and resources. Remember the tragedy of the commons. Because companies can now own the plant by patenting seeds, like Monsanto does, poor farmers must go to them to continue tending to their fields, going into debt buying seeds that are 1700% more expensive than their unpatented counterparts. The reason farmers have to use theses seeds is that they can thrive in nitrogen rich soil and withstand pesticides, both of which have been called ecological narcotics; the more you use them, the more they become necessary. The farmers go into more debt buying those pesticides. This is a cycle of debt suspiciously similar to the indentured servitude model. In the last 16 years, also according to The True Cost, there have been 250,000 recorded cases of farmer suicide via pesticide ingestion in India. This is the largest wave of suicides in history. This post is merely a sampling of the issues associated with fast fashion, but it gives us a primer to understand that a buying cheaply and frequently contributes to the problem. I’m not saying that anyone shopping in Zara is to blame for terrible business practices, but I am saying by choosing to be more careful in our clothing choices, the businesses would be forced to reevaluate in order to maintain profits. Pamela Ellsworth, chairperson of the Fashion Institute of Technology’s Global Fashion Management Program, says, “Eventually we are going to have to train consumers in the U.S. to pay more for clothing. It can’t be the only commodity that gets cheaper every year.” There is a huge cost for fashion. In part two, we will discuss fashion branding, designer clothing, brand loyalty, and the ways Westerners (myself included) fall into the trap of hyper consumerism.